This article is based on turnout figures as of 3 p.m. on Friday, Nov. 11. For more updated data, see our story from Tuesday, Nov. 15. Early voting surged. Election Day voting plummeted. The net result: A smaller share of eligible voters cast ballots in 2016 than in either of the previous two presidential elections. The raw number of votes rose: About 1.4 million more Americans voted in this year’s election than in 2012, a total which itself was down from 2008. But the electorate was growing in the meantime: About 57 percent of eligible voters cast ballots this year, down from 58.6 percent in 2012 and 61.6 percent in 2008, which was the highest mark in 40 years. 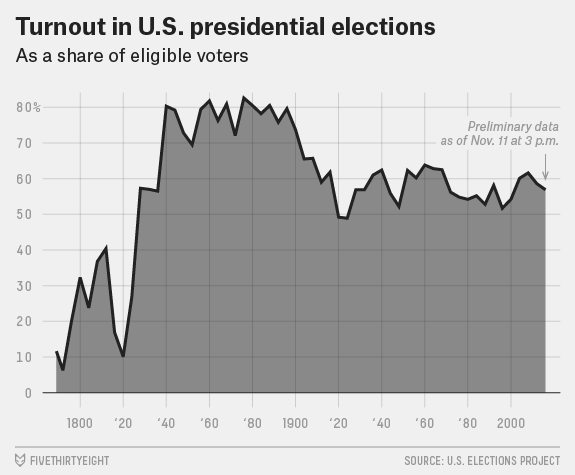 Turnout still remained well above levels for most presidential election years from 1972 to 2000. The drop in turnout was uneven. On average, turnout was unchanged in states that voted for Trump, while it fell by an average of 2.3 percentage points in states that voted for Clinton. Relatedly, turnout was higher in competitive states — most of which Trump won. In the 14 swing states — those where either the winning party in the presidential race switched from 2012 or where the margin was within 5 percentage points — an average of 65.3 percent of eligible voters cast ballots. In the other 36 states and Washington, D.C., turnout averaged just 56.3 percent.1 That gap exacerbates a tendency for turnout to be higher in the places where candidates concentrate their travel, advertising and other get-out-the-vote efforts. These numbers are preliminary estimates subject to change as our decentralized electoral system continues counting votes. There is no official national turnout figure, and the best available estimates — from Michael McDonald, associate professor at the University of Florida, who gathers data at the U.S. Elections Project; and from FiveThirtyEight contributor David Wasserman, who is gathering national vote counts — suggest that more than 4 million votes remain uncounted, more than half of them in California.3 As a result, figures in this story may not line up with vote-count data published by media organizations. Many news organizations after the election claimed that 46.9 percent of people didn’t vote. But that figure, which may have originated from this tweet, was based on dividing vote totals as of Wednesday morning by all eligible voters. Final turnout numbers could be even lower than these initial estimates. Just after Election Day in 2012, McDonald projected that turnout would be 60 percent of eligible voters; the final figure was 58.6 percent. In 2008, McDonald initially estimated that 133.3 million people voted for president — about 700,000 more than the final count. Heading into Tuesday, McDonald cited the early-vote totals in projecting that 135 million people voted this year. By Wednesday it looked like just 128 million had. McDonald keeps updating the figures as more votes are counted, adjusting his projections for how many votes remain uncounted. As of Friday afternoon, the best estimate was nearly 132 million votes, of which 35 percent were cast before Election Day — up from 25 percent in 2012. The number of Election Day votes was down an estimated 13 percent this year from 2012. This data doesn’t tell us about the turnout of specific demographic groups. Exit polls can be used to estimate the proportion of the electorate that belongs to various demographic groups and which way they voted, but these polls missed the election result badly this year and face challenges counting some demographic groups. Once all the votes are counted, combining local turnout numbers with demographic data could give a better indication for how people in demographic groups voted — and for whom. That’s based on unweighted averages of turnout in each group of states. Weight by population, and turnout in each group is slightly lower, though the difference between the groups is roughly the same. 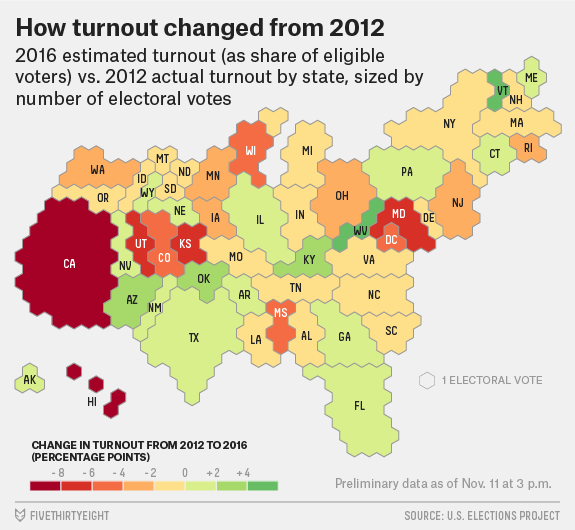 Turnout was 16 percent higher, on average, in swing states than in other states. Increase Trump’s and Clinton’s vote totals so far in each non-swing state by 16 percent, and her lead would grow from roughly 460,000 to roughly 650,000. Wasserman is collecting presidential votes that have been counted so far; McDonald is using available data to estimate the total number of people who voted. As a result, McDonald’s count is higher. Though a small proportion of the gap between their counts is also due to McDonald counting ballots without a vote for president. McDonald might also be understating the number of California votes still uncounted. He didn’t respond to a request for comment.